The Armadale Gosnells Landcare Group (AGLG) is an independent, incorporated community led catchment group. AGLG operate within the Cities of Armadale and Gosnells local government boundaries focusing on the Upper Canning, Southern and Wungong River catchments. The Group coordinates landcare planning, river restoration , bushland management, community action and awareness programs. AGLG is a not-forprofit organisation consisting of elected senior staff representatives of the Cities of Armadale and Gosnells, government agencies, community groups, volunteers and landowners. • Improve water quality monitoring networks and distribution of data to guide future investments in water quality improvements. • Ensure that river restoration and revegetation activities and other restoration/ landscape treatments of foreshores contribute to maintaining the ecological condition of AGLG’s priority river areas. 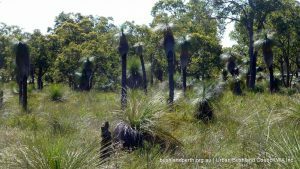 • Ensure that prioity areas of natural bushland are appropriately conserved, restored and managed to provide a sanctuary for native species. • Identify the sources of sediment and extent of sedimentation so that an appropriate erosion and sediment management program can be established to protect priority river areas. • Continually improve people’s recognition of, and attitude to, local natural resource management issues that will provide leverage to a greater uptake of sustainable behaviours in the community.